The appliance of the week is the Kenmore free-standing induction range model 92183. It is available in stainless steel only. The Kenmore 92183 carries on the visual cues of the 2011 Kenmore line, with the characteristic tapered metal handles and updated Kenmore logo centered on the lower edge of the console. The induction cooktop on the 92183 has four burners (10", 8", 7", and 6"), offering wide flexibility for the home cook. The burners are all induction-based, so time to boil is drastically reduced and temperature control is vastly improved over gas and electric (coil or radiant) cooktops. Low temperature cooking is much easier on this induction cooktop than on gas or more conventional electric cooktops, and the speed to reach cooking temperatures is a huge leap over either traditional cooking technology. It should be mentioned that induction cooktops require magnetic cookware with a completely flat bottom. If you don't have magnetic cookware, now is a great time to get some! 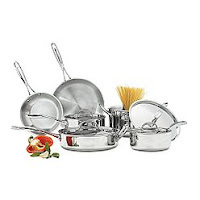 For an extremely durable set at a great price, consider the Kenmore Tri-Ply 10pc cookware set. 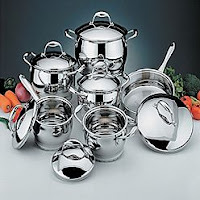 For the more sophisticated cook, consider the BergHOFF 12pc Professional cookware set. The oven door has a very large window, granting easy viewing of the entire oven cavity. Halogen lighting inside makes it even easier to see what's cooking. True convection means that all three oven racks can be used to cook at the same time with greater speed and better results, along with faster preheating. 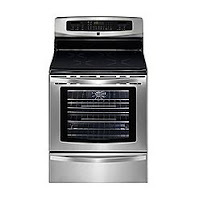 A huge 5.8 cubic foot oven gives you plenty of room for the biggest turkey or lots of pies. And, the warming drawer below lets you keep your food warm for extended meals or when meal prep is going to take a while. It's also great for entertaining, to keep food and/or plates warm for guests. The Kenmore 92183 is equipped with Sabbath mode, in case this is a concern. And, it has the Kenmore-exclusive AirGuard system to virtually eliminate odors from cooking (if you choose to) or self-clean cycles (automatic). If you're looking for an electric range that improves your cooking experience and makes baking, roasting, and stovetop cooking easier, the Kenmore free-standing induction range model 92183 is an excellent range for you. If your kitchen has new Kenmore Elite appliances and you'd like an induction range that matches, or if you prefer the Kenmore Elite styling, there is the Kenmore Elite free-standing induction range model 92703. 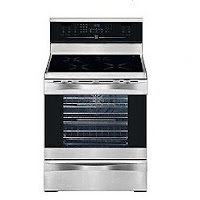 This model has a touch-sensitive glass control console, Kenmore Elite styling, console accent lighting, and a 6.1 cubic foot oven with two halogen lights and a built-in temperature probe.